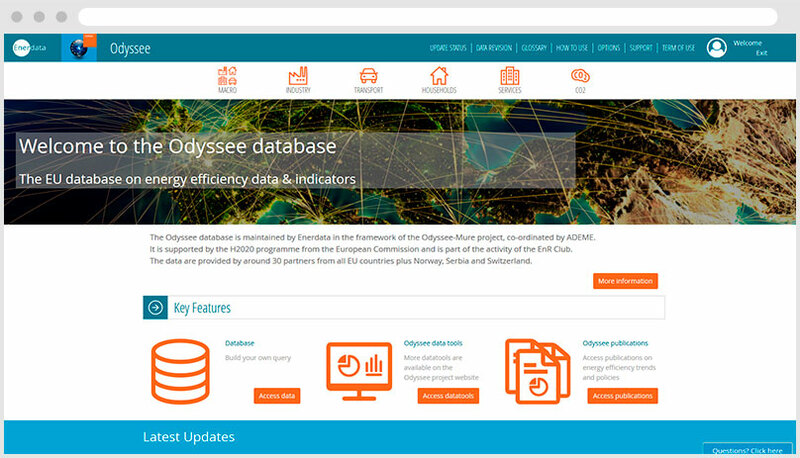 The Odyssee database contains detailed energy consumption by end-use and their drivers as well as energy efficiency and CO2 related indicators. Latest available data is providing by national representatives, such as energy agencies or statistical organization, from all EU countries as well as Norway, Switzerland and Serbia. Odyssee data and indicators are available through a friendly interface enabling advanced analysis, with the results of queries provided in tables and/or graphs and with the possibility to change units. Apart from the full database, six data tools have been developed to monitor progress in the market penetration of a selection of energy efficient technologies and practices, to identify the drivers responsible for the variation of energy consumption, to compare and benchmark the energy efficiency of performance of countries. The access is free for all EU Ministries, Concerted Action EED, EED Committee Members and EU universities and research centres for non-commercial uses and via subscription for other users.